The Richelieu-Louvois Library, part of the French National Library, recently reopened to the public after extensive (ongoing) renovations. You can pay for a tour of the library, but you can also view the famous Salle Ovale (oval reading room) free of charge. Unfortunately, no photos are allowed, so the photo above is from the Parisinfo.com site. Of course, this is a working library. Opening hours for the reading rooms are listed here. EUtouring.com offers a history of the library, whose roots dates back to the 1300s. 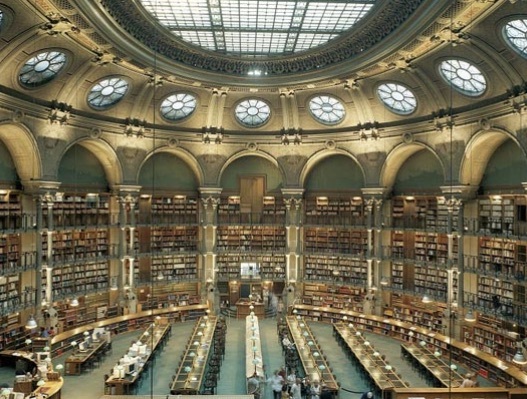 Be sure to also visit the Bibliothèque Mazarine in the 6th arrondissement!